Father Junipero Serra was hiking near this river when he suddenly stubbed his toe on a rock and shouted "DAMNIT!!!". The rest is history. Just kidding... Mission San Diego de Alcala was founded in 1769 by Father Junipero Serra and its original settlement was actually at the location now known as Presidio Park, just above Old Town. But five years later, the mission was moved to its present location in Mission Valley, in part to have better access to dependable water (the San Diego River was actually a useful river back then). 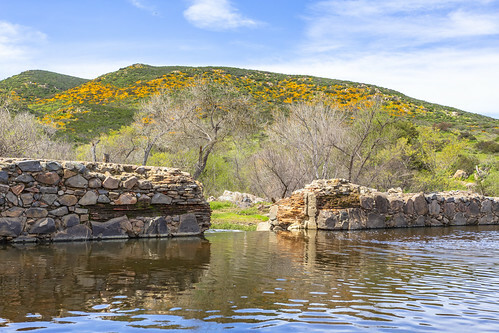 The friars scouted out a location about six miles upriver as an ideal spot to construct a dam and basin, but construction didn't begin until 1809. Indian labor from the mission's population was used to build the dam and flume and it was one of the most ambitious in the California mission chain. The dam was built across the head of Mission Gorge, and the 244-foot long, 13-foot thick, 13-foot wide dam was constructed of stone and cement on exposed bedrock, creating a permanent reservoir behind it. Water was released through gates and spillways into a six-mile long gravity fed tile lined flume, down the gorge and Mission Valley, ending in a settling basin near the Mission. Construction was completed by 1815 and the padres had the water they needed. The usefulness of the dam to the mission would not last very long: the missions were secularized in 1833 and by 1867, the dam was in disrepair and mostly in ruins. The remains of the dam are still in place, but the flume system is long gone.